Thanks for stopping by! Since you're visiting my site, I assume you love books and reading . . . maybe even writing. I've been writing since I was nine years old. My favorite thing to do back then was watch a TV show and then rewrite the episode with myself included as a young character. Great fun! But now I spend my time creating middle grade novels instead. 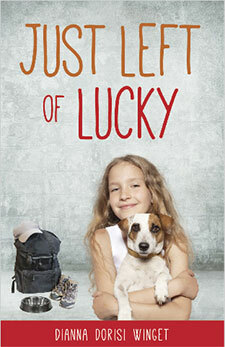 Take a minute to meet twelve year old Shannon O'Reilly, a young girl whose passion for her little dog, Boone, helps her weather the storm of poverty and homelessness in my latest novel, Just Left of Lucky. Then hop on over to my Books page to meet some more great heroines like Poppy Parker, from A Million Ways Home, who's calm life is upended when the grandmother who's raising her has a stroke and ends up in the hospital. Or spunky, sweet Piper Lee DeLuna, the star of my debut novel, A Smidgen of Sky. The last thing Piper wants is a step-dad or bratty step-sister, and she's determined to stop her mama from remarrying at any cost! And you can continue Piper Lee's adventures in the sequel, A Sliver of Sun. Surf around the site to find out more about me, to see pictures of my two adorable dogs and my book events, or to read a free short story or article. Thanks so much for visiting! Site design © & maintenance by xuni.com. All content © 2011-2019, Dianna Dorisi Winget.